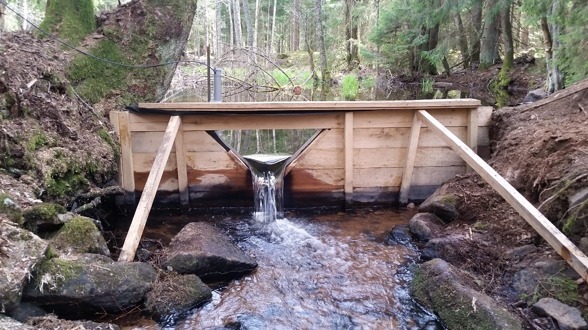 In Asa we have now finished the building of the dam wall in the inlet to Feresjön. It was not easy! First the construction was stopped by the winter and later the spring flood, but as you can see on the picture it is now ready for use and we have started measuring. The critical reader might say that the construction looks somewhat crooked or even unstable, but that is what you get when you build directly on top of the granite of Småland, and we promise that it is both very stable and waterproof. Since the dam is located on private land we first did not know of its existence. Its location is a place with local history. The whole dam construction was built to run a sawmill many years ago. The only thing missing was the construction to control the water flow; a construction that was located on the exact same spot where we now have our v-notch weir. Also, the new wall is fixed to an oak beam from the original construction that is still in the water. 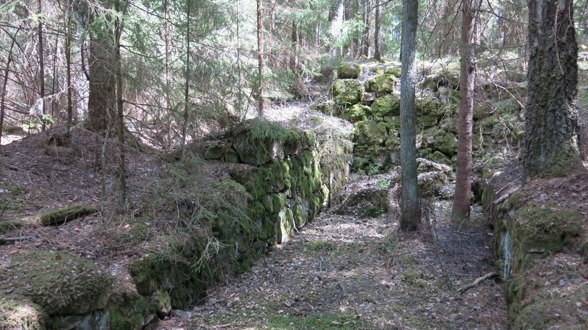 The foundation of the sawmill is still to be found close to the dam (picture below), and according to the owner of the forest there are also still old iron rails which was used to transport the timber down to Asa. Unfortunately we have not found them, yet.